Department of Social Welfare, Tehri Gharwal is constantly working to bridge the gap between marginalized population of the society and main stream. Implementation of social security and welfare schemes is being taken up on priority with increased coverage of schemes every year. Recently organized (27th of June, 2017) multi-purpose camp in Pratap Inter College, New Tehri is one such example of the effort by the department. The camp witnessed the presence of District Magistrate Ms. Sonika, Chief Development Officer (CDO) Mr. Ashish Bhatgai, MLA Mr. Vikram Singh Negi, District Welfare Officer Mr. Avinash Singh Bhaduria, Block Development Officers Mr. Vijay Ghunsola, Ms. Anandi and Ms. Baby Oswal. The main objective of the camp was to reach out to the marginalized community of the district and register them under various social security schemes. 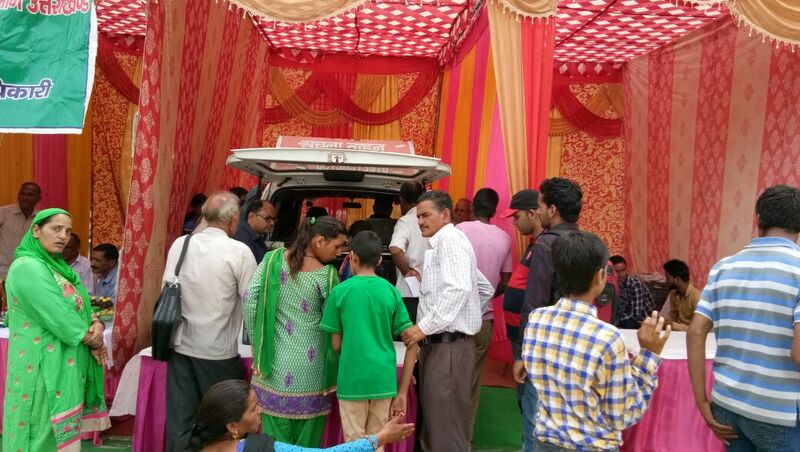 For the awareness and promotion of the camp Soochna Seva team has been approached and the result of which a large gathering has been seen to avail the benefits. Income certificate were also being generated by the revenue department. Interestingly, eligible disabled were also distributed with support machines and equipment’s such as wheel chair, spectacles etc. Mal-nourished children were got treated during the camp by the doctors from Dehradun. The team put up a stall and provided digital services to the beneficiaries and huge demand has been noticed among the people. The whole support was appreciated by officers from different departments. In order to make the camp successful, Soochna Seva team created awareness among 250 Gram Sabhas covering 4 blocks of Tehri Gharwal district. A total number of 479 people participated from across the districts providing referral services Counselling/therapy, Eye Certificate, ENT related Certificate, mentally retired Certificate and Handicap Certificate.